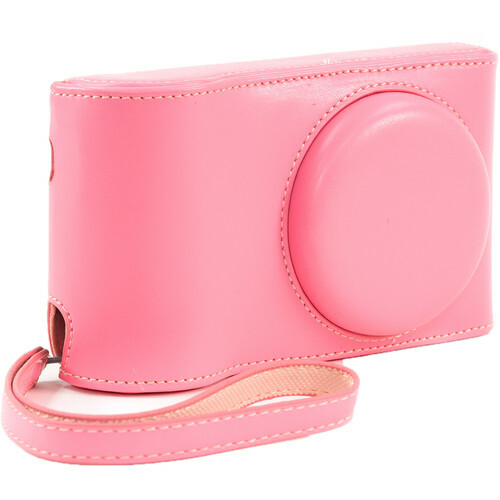 Give your Samsung Galaxy Camera GC200, EK-GC110, or EK-GC100 camera a touch of elegance while protecting it from dirt, scratches, and bumps with the Ever Ready PU Leather Camera Case with Strap in pink from MegaGear. This one-piece includes a matching wrist strap. For style, this case has attractive stitching reminiscent of old world craftsmanship, and a magnetic-flap closure. The leather-like sustainable polyurethane material reflects new world ecological sensibilities. Made of the same polyurethane but with a suede-like finish, the interior softly caresses your camera while also protecting it from scratches.